For the July challenge I wanted to come up with something that shouted 'Summer!!". Something cool, light, with lots of fruit. Given my love of meringue - both making and eating - what better dessert than a pavlova. The national dessert of both New Zealand and Australia, Pavlova is basically a large pillow of meringue covered with whipped cream and fresh fruit. Purists insist kiwi fruit must be in the mix for authenticity, but not everyone agrees. It was named in honor of the great Russian ballerina Anna Pavlova; never having seen her dance, one can only assume she was as light and delicate as her namesake! Don't make the pavlova on a muggy day. The moisture in the air will prevent the egg whites from whipping to their peak. If you're not serving the pavlova immediately, store the meringue in an airtight container (up to 3 days) and top with the cream and fruit just before serving, so that the meringue doesn't become soggy. All the recipes I saw called for superfine sugar. To make your own, put the sugar in a food processor and pulse until the crystals are half their original size. Easy! Make sure your bowl and beaters are clean, clean, clean and free of any grease or oil. Preheat oven to 250 degrees and place rack in center of oven. Line a baking sheet with parchment paper and draw a 7 inch circle on the paper. In the bowl of an electric mixer beat the egg whites on medium-high speed until they hold soft peaks. Start adding the sugar, a tablespoon at a time, and continue to beat until meringue holds very stiff peaks. Make sure the sugar is dissolved by rubbing a bit of meringue between your fingers - if it feels gritty, keep beating! Sprinle the meringue with the vinegar and cornstarch and fold in with a rubber spatula. Gently spread the meringue inside the circle on the parchment paper and smooth the edges. Bake for 1 hour 15 minutes or until the outside is dry and a very pale cream color. Turn the oven off, leave the door slightly ajar and let the meringue cool completely in the oven. Fresh fruit - kiwi, strawberries, peaches, berries, pineapple, etc. Pavlova looks amazing nad so colourful.Its areally good effort made perfectly. This looks beautiful! Very nice summer dessert! 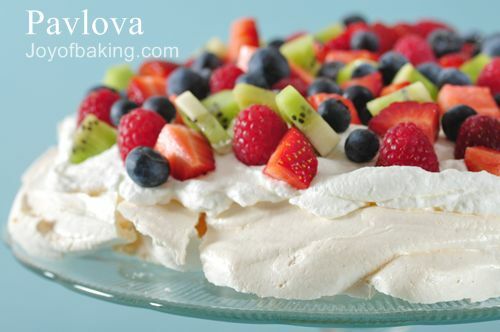 I have never made pavlova but it looks amazing! Love the fruit topping and all the colors it adds. Great pick! I'm so excited! I can't wait to make this and see what everyone else comes up with too!!! It's to be my first post, so I hope all goes well. What a great idea for a summer challenge! Oh, I just remembered: if anyone wants to see Anna Pavlova dance, there are some YouTube videos. It's a bit grainy and jerky since filming was in it's infancy, but you definitely get an idea of her incredible strength and artistry! You don't know how happy I am. My husband being gluten free can eat this but has discouraged me from making it. My daughter thought it would be a good idea, anyway. I have not done anything about it BUT now I have another reason to make it. Yeah team! I've recently made a chocolate Pavlova that was a big hit for Father's day. I want to make a white one this time and do individual servings... try out my piping skills :-) If you've never had Pavlova you are missing out... absolute yummy-ness! I have missed the last several challenges, but really want to give this a try...never made Pavlova before. Looks terrific! Looks perfect Sue; have never made pavlova before! I’m going to have to make it – it just looks soooo good! July Roundup & Happy Anniversary!